An impending birthday is a thing of total joy… there are balloons to blow up, presents to be wrapped, cake to be made (promptly eaten, then remade in a rush the day before), outfits to pick, bottles to pop, and old friends to get together all in one place. It doesn’t matter how many birthdays pass, the feeling of excitement never does. We at Wedfest are no exception; we LOVE birthdays, and part of our daily joy is ensuring that everybody – from birthday boys and girls right through to guests – are equally as giddy as the big day approaches. For us, by our very nature, that means starting at the very start – the invitations! 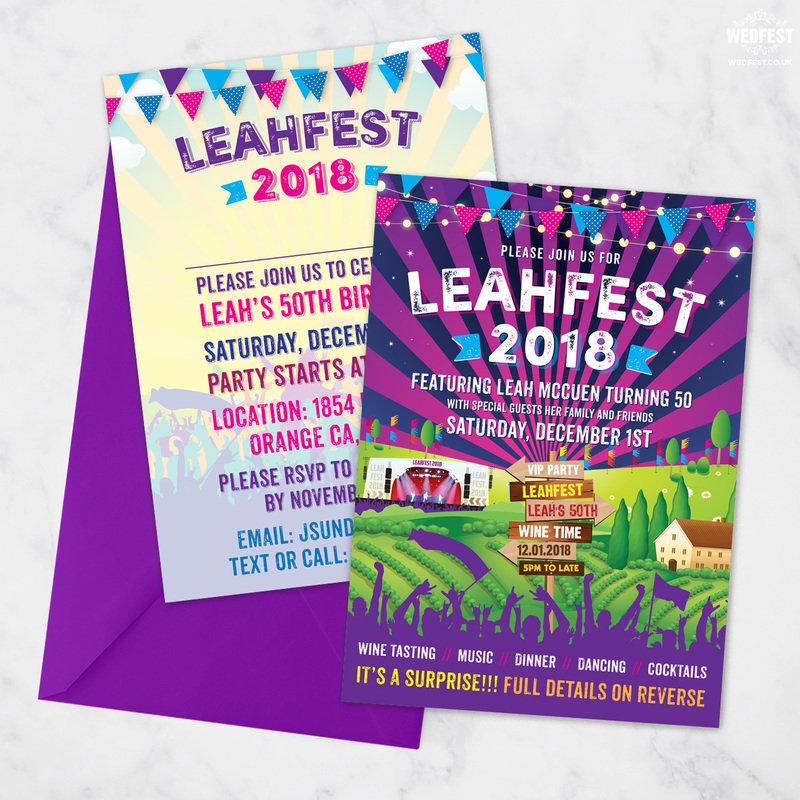 And when it comes to creating exciting festival themed birthday party invitations we are the masters in that department. 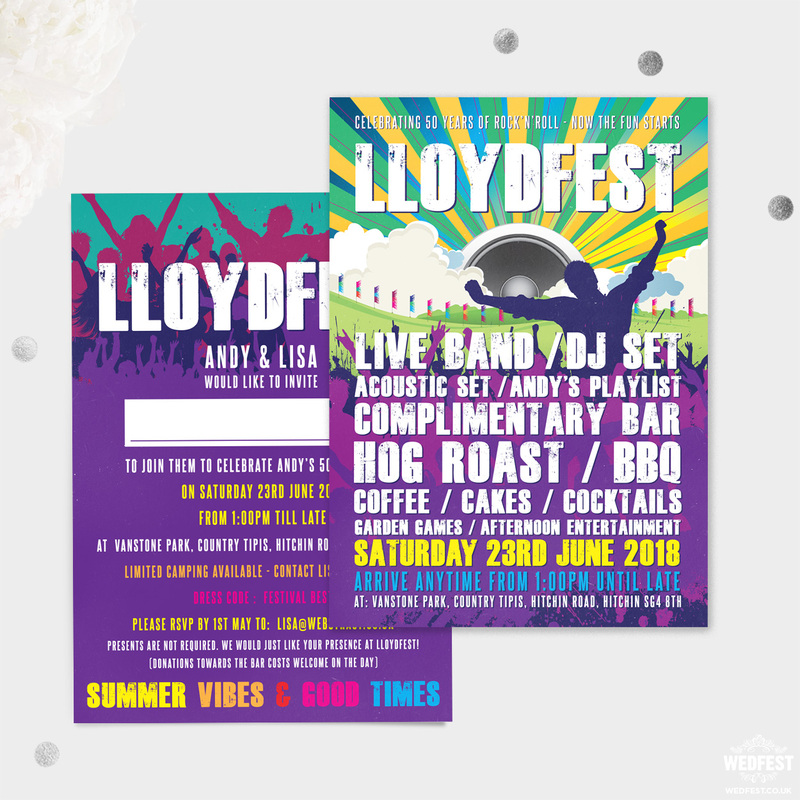 At Wedfest we never do things by halves, so when our lovely customers approach us for nifty, not-what-you’re-expecting birthday party invitations, we make it our mission to deliver something that truly packs a punch each and every time. 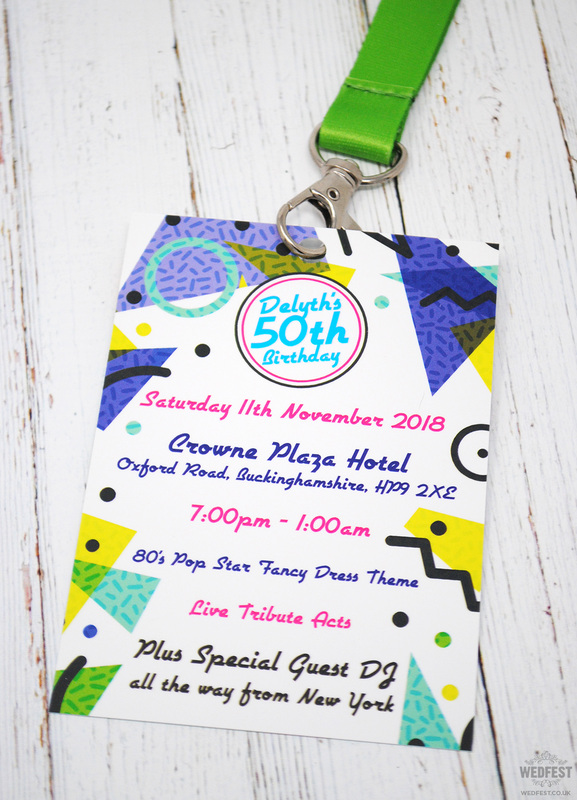 We’ve become well known around the UK (and further afield, we might boast) for our renowned skill at making authentic looking festival ticket invitations, and we’ve found these to be a total hit with our birthday crowd too! Many a summer baby (or glass-half-full Pisces) has come to us to kit them out for their very own festival themed birthday party invites. 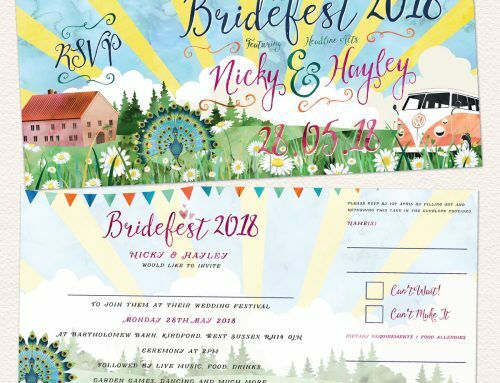 These are especially popular with couples, who get a crowd worthy of Woodstock together by inviting all of their friends and family and having a rockin’ knees up to celebrate an important milestone. Our team of Super Designers love nothing more than knuckling down to create a design that feels totally ‘you’ and we tweak and tinker until all the details are there. 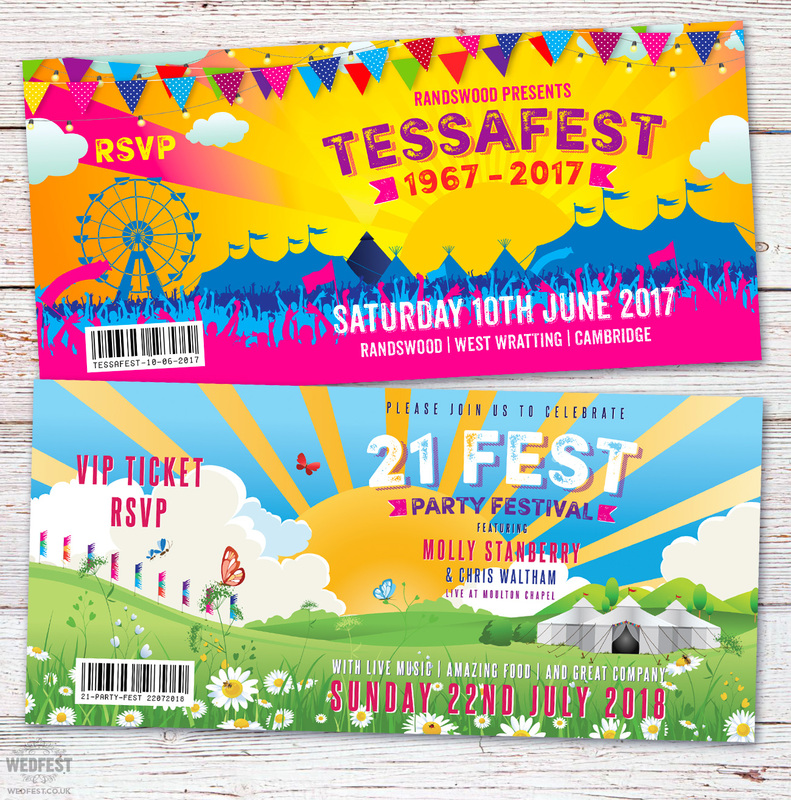 These two festival ticket samples below show a range of designs. 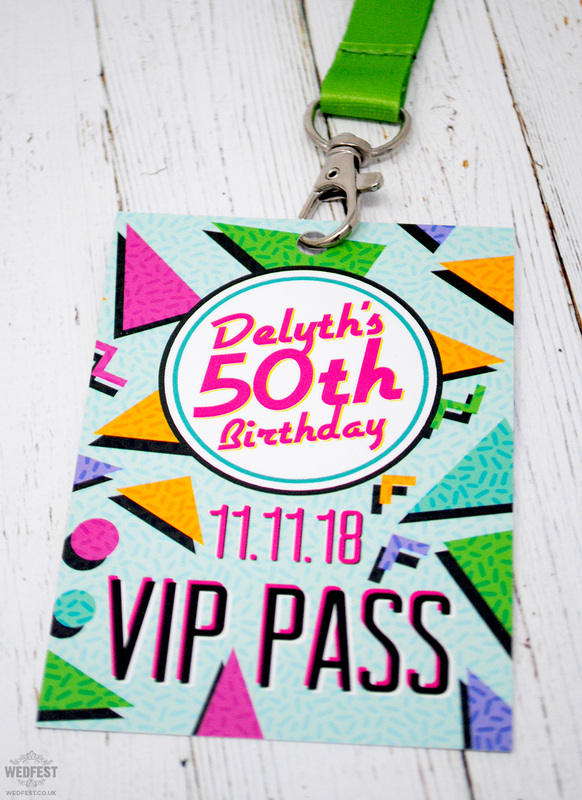 In keeping with the festival theme, we even offer fun additional services such as authentic festival style birthday party wristbands and festival style lanyards that are fully customisable to tie in with the theme of your birthday party invitations. 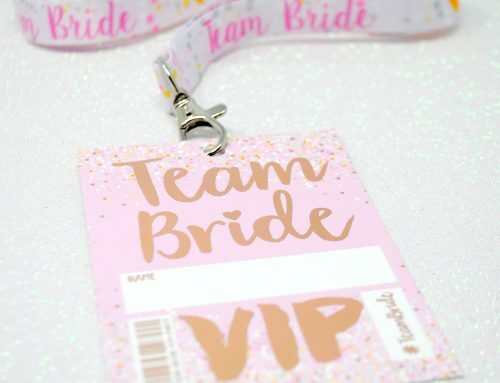 Guests love this personal touch, and you can take centre stage on your special day by personalising your birthday party stationery with all of your favourite quirks. They make for a great keepsake too! 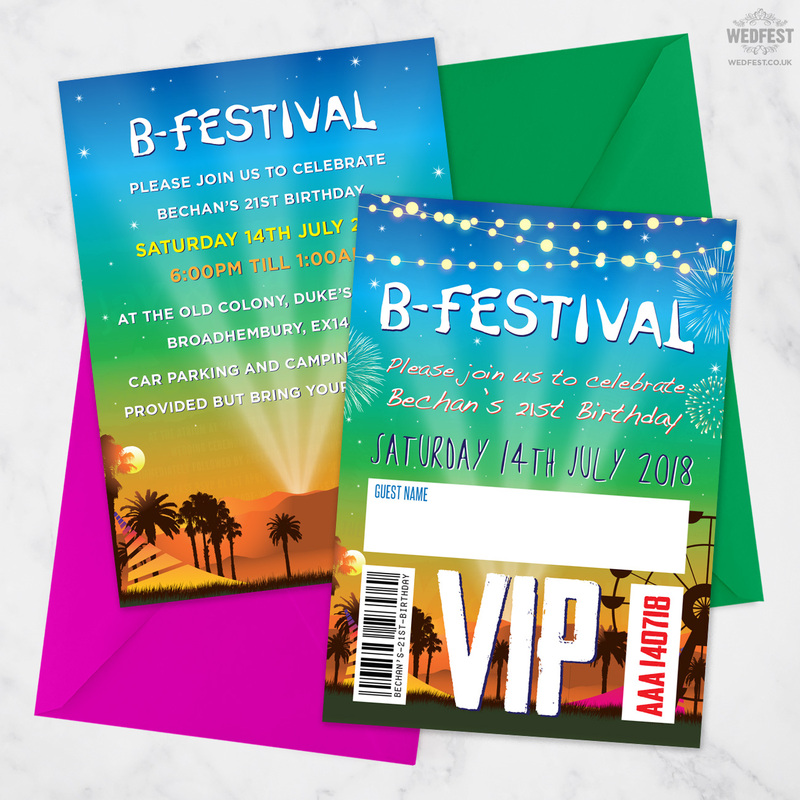 Little extras like party playlists, festival dress codes and custom barcodes help ensure that guests really buy into the theme, which makes the party atmosphere hard to beat. 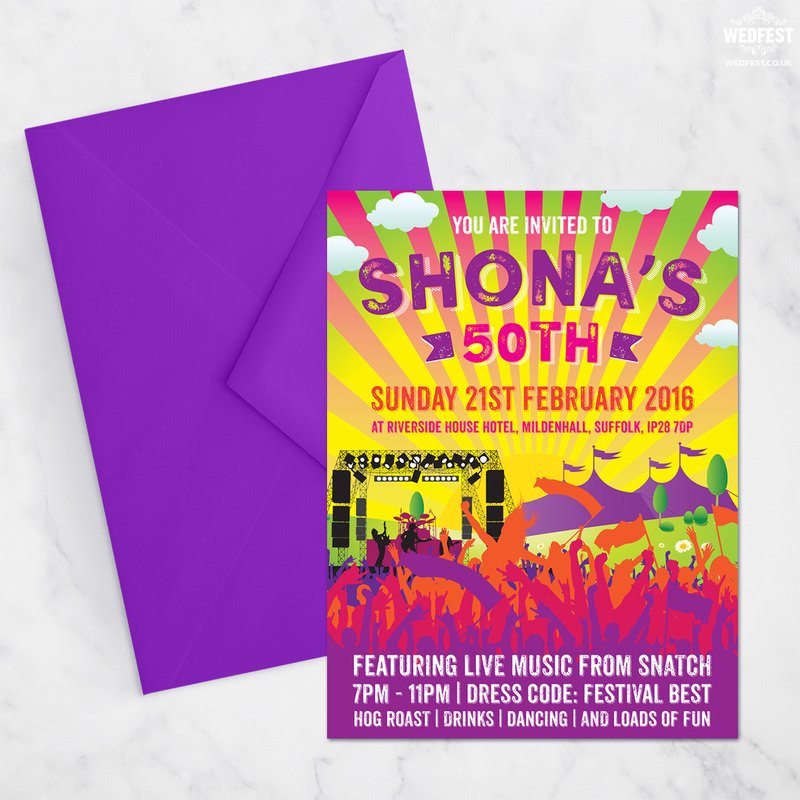 Below you can see a few examples of various different invitations we have design for 50th Birthday Parties! 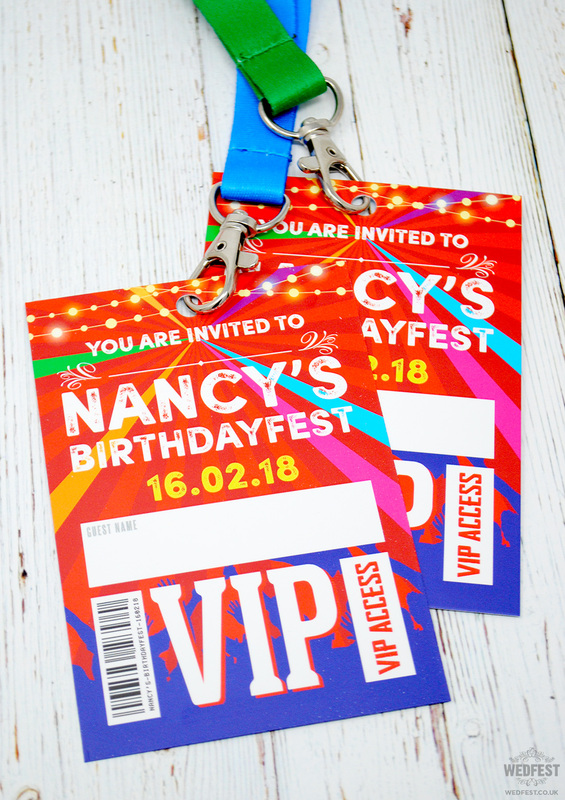 Lots of our customers love sending out the festival style VIP pass lanyards as their birthday party invitations. Those who know us well will know that our talent for stationery isn’t limited to our love of Glasto. We’re a dab hand at considered, crafted invitations and stationery that truly reflect the birthday boy or girl. We pride ourselves on being fantastic listeners, and from teeny tots to super centenarians we take the time to understand our customers and create something unique, weaving in all of those little details that make for a personal touch. So – whether young or old, ecstatic or begrudging, Bowie-mad or Bieber-clad, get in touch today and we’ll make sure it’s a milestone to remember. 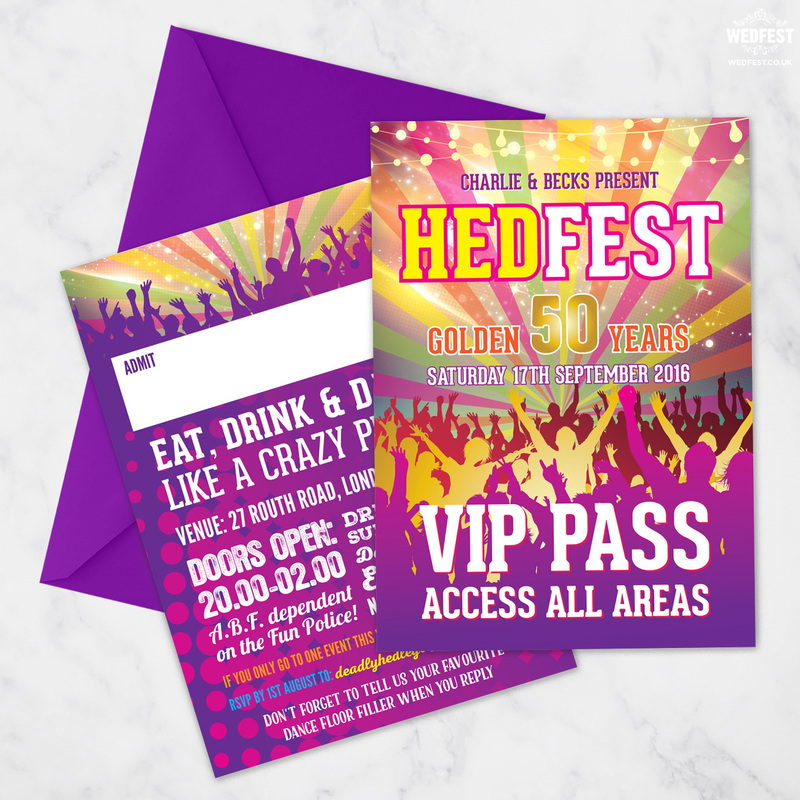 Of course it doesn’t have to be festival themed, if thats nor your vibe we can design anything to suit really. 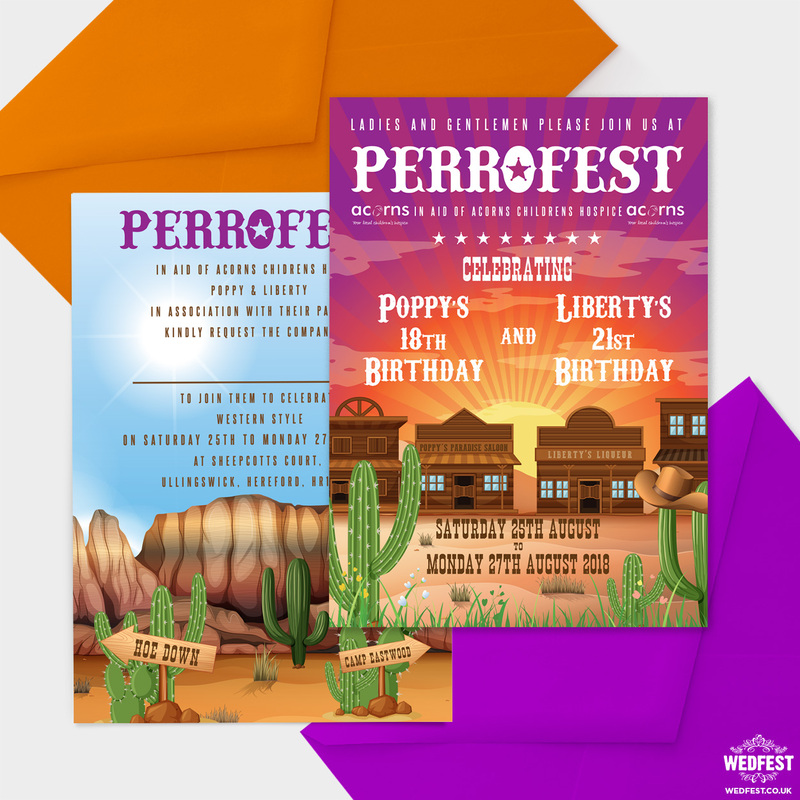 Check out these awesome Wildwest Western themed birthday party invitations for a joint 18th birthday and 21st birthday party.